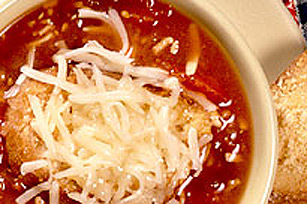 Crusty, cheesy French bread and a steaming bowl of onion soup - enjoy this cold-weather Classic French Onion Soup all year long. STIR in Swiss and mozzarella cheeses. TOP each serving with a slice of toasted French stick. Sprinkle with KRAFT 100% Parmesan Grated Cheese and 1/3 cup additional grated cheese.